Relax in the heart of the Garden District of New Orleans. 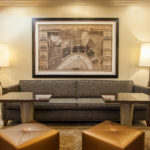 Enjoy the impressive location of the Hampton Inn New Orleans-St. Charles Ave./Garden District hotel in the heart of the Garden District, on the St. Charles streetcar line, winner of the TripAdvisor Hall of Fame award. Admire stunning local architecture and oak-lined sidewalks, and find yourself just minutes from the historic French Quarter, Audubon Park and Zoo. Walk five blocks to reach Magazine Street with its array of boutiques, antique shopping, restaurants, and bars. 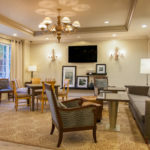 Tulane and Loyola Universities are just two miles from our hotel, which offers convenient and comfy accommodations for students and visitors. Visit during Mardi Gras for a prime location in the center of the celebrations – the parades roll right down our street! Combining value with comfort, our hotel offers a full package of amenities designed to give you a relaxing and productive stay. Make yourself at home in a guest room with free WiFi and a clean and fresh Hampton bed®. Choose a suite for a fabulous avenue view with a sleeper sofa and table in the living room area. Prepare for a busy day with Hampton’s free, hot breakfast or grab one of our free Hampton On the Run® Breakfast Bags, available Monday to Friday. 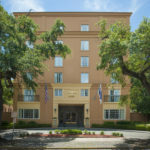 We offer a business center and meeting room for 2-30 guests, facing St. Charles Avenue. Refresh in the courtyard by the outdoor pool and enjoy complimentary access to our offsite fitness center just a block from the hotel.